The relative performance of two integrated machine concepts (combined harvesting / forwarding capabilities) was assessed against a conventional harvester / forwarder CTL system in a simulated thinning regime. Multiple-regression based on the simulation output was used in deriving time-consumption functions at the systems and machine level. Descriptive stand variables could be reduced to; harvest volume (m3/ha), stem volume (m3), lead distance (m) and object volume (m3/ stand) while maintaining acceptable statistical rigour (R2 > 0.95). The ability of one of the integrated machines to process logs directly onto the bunk provided it with an advantage that more than compensated for its reduced harvesting efficiency. Both integrated machine systems show a competitive advantage in forest structures with low object volumes and long or frequent relocations. Factors negatively affecting forwarding productivity (e.g. long lead distances) favour the conventional two-machine system. A break-even economic analysis showed that integrated machines could present a feasible alternative to contemporary mechanised CTL systems. Keywords: CTL, harvester, forwarder, harwarder, thinnings, productivity, time-consumption, simulation. The advent of fully mechanised cut-to-length (CTL) systems brought with it significant capital investments demanding efficient working procedures and effective operations management. Typically, such systems consist of a single-grip harvester and a purpose-built forwarder operating in a sequential manner (here referred to as a twin-machine system, TWIN). The economic viability of this system is especially dependent on utilisation levels and productivity rates. Subtle interactions among the harvesting machines and changes in the working environment can result in widely varying production rates  . Stand attributes such as low stem-volume or high branch density might hinder the harvester, while topographic features such as increased lead distances and difficult terrain might reduce forwarder efficiency. Resulting system imbalances can imply reduced utilisation of one of the component machines in a system. In Central-Western European countries with predominantly small management units (< 5 ha.) the logistics of frequently having to balance such a system is complex and administratively taxing. The low potential for benefiting from 'economy of scale' factors at a stand-level in these forests is further eroded by the sparse dispersion of forest stand clusters on a landscape level. Even in the boreal forests of Scandinavia, patchwork ownership patterns result in a similar forest 'structure'. Increased relocation and set-up penalties are incurred and machine utilisation is reduced as a result. Contemporary silvicultural systems requiring frequent light thinnings (low harvesting volumes) compound the problem of finding economically feasible thinning methods. The necessity for restructuring and innovation in the timber supply chain, both with regard to technical, procedural, and organisational issues has been emphasised recently (cf. ). A shift toward consumer-oriented production in a chain-wide perspective further complicates the decision-making process. Integrated machines (integrated felling, de-branching, cross-cutting, loading and terrain transport capacity on one base machine) offer an opportunity for organisational and technical rationalisation. Development of a new generation of these machines has been ongoing since the beginning of the 1990's, though similar concepts have been developed intermittently since the 1950's [11, 14] . Management complexity is alleviated as the machine operates independently, only one machine needs to be relocated and the operator achieves greater familiarity with the work object at hand. More importantly, timber is supplied at roadside soon after the commencement of felling, thereby diminishing delivery lead times, and a single machine captures, processes and transmits all production data. A technical basis for providing customised forest harvesting is at hand. A number of time-studies on the integrated machines have been published recently (c.f. [2, 10, 31, 32, 36] ) and reflect the growing interest in these machine concepts. The aim of this paper is to evaluate the consequences of replacing the twin-machine system with one of two concepts of integrated machines by comparing their relative efficiencies, highlighting their strengths and weaknesses and providing a basis for sensitivity analysis on technical developments. We also reflect on the implications the application of these systems might have for improving primary material flow in the timber supply chain. Simulation has proven to be a useful tool in analysing harvesting systems and identifying bottlenecks in the primary stages of wood delivery, and is therefore used as the primary analytical method here. (cf. [6, 7] ). A harvesting system, based on productivity norms including a single-grip harvester and a purpose built forwarder, was assimilated and simulated using the SAS® statistical package. The analysis involved identifying all significant elements from normal working procedures and deriving aggregate time-consumption functions for each of the components harvesting, forwarding and relocation. The standard CTL system (TWIN) was tested against two concepts of integrated machines (Fig. 1). The first concept is based on a forwarder chassis and functions alternatively as a harvester or forwarder, exemplified by the Ponsse Buffalo Dual  (referred to as DUAL) by attaching either the harvesting-head or alternatively the loading grapple to the boom. This transformation also involves mounting or detaching the stanchions on the bunk. Both the head and stanchions are adapted with quick-couplings, which improve the viability of the system. The second concept depicts a machine with a single integrated harvesting-head and loading grapple, for example the Valmet 801 Combi  (referred to as COMBI), which is able to both fell and load the bunk in one pass. Both the integrated machines have a crane reach of approximately 11m with maximum felling diameters of 50 cm. The DUAL system is considered to represent an intermediate machine concept in the transition between the TWIN and COMBI concepts. A number of adjustments equating to the reported technical differences of the integrated machines' harvesting and forwarding capabilities were then made running a duplicate simulation, and the comparative performances of the integrated machines were evaluated. Time-consumption figures are given gross effective time (E15 minutes), which include delays of up to 15 minutes, and volumes are given as m3 solid-under-bark (s.u.b.). Thinning policy was determined in accordance with guidelines for Norway spruce (Picea Abies (Karst.) dominated stands in southern Sweden  . A stand with a Site Index (SI100) of 28, correlating to a mean annual increment of 9 m3/ha was chosen, and three thinnings were prescribed at ages of approximately 30, 40 and 55 years, each removing around 28% of the basal area (Table 1). Some variation was introduced by randomising the predictor variables in accordance with more natural distributions (Table 2) (cf. ). Stem-volumes, lead distances (distance from stand centre to roadside stack), and the number of trees harvested per ha. were normally distributed. Both stand size and the relocation distance were modelled using a uniform distribution to ensure an even representation across the spectra as the actual distributions obtained in Denmark were too skewed for obtaining generic results. Lead distances were independent of stand size. A triangular distribution was used in predicting the proportion of timber processed directly onto the bunk for COMBI. Table 2. Variables applied in the simulation and their respective distributions. (parameters) 1st thin. 2nd thin. 3rd thin. Proportion of timber processed directly on COMBI bunk.  Mean stem volume of harvested trees. Time consumption for the single-grip harvester was based on productivity norms valid for stem-volumes between 0.04m3 and 0.3m3 s.u.b. (Fig.2). Terrain conditions were classified as easy, 1:1:1 according to the system in  . The following harvester work-cycle elements are normally considered in a productivity analysis: Prepare, Position, Boom-Out, Fell, Boom-In, Process, Move & Delay. However, in simulating total productivity with a single-grip harvester, it was considered sufficient to summarise these into two work elements  ; repositioning the machine between operating positions in the stand (MOVE), and preparation, felling and processing, including all boom movement (PROCESS). A PROCESS penalty of 0.25 min.m3 was placed on DUAL as compared with the single-grip harvester. The harvesting function was considered to be slightly impeded by the presence of the 'bunk-bearing' bogie wheel set, as the boom is mounted behind the cabin. This implies that timber has to be processed with the boom in an extended position, or that the tree must be turned and processed parallel to the striproad. In addition, a time penalty was imposed for interchanging the harvesting head with the grapple and removing or mounting the load bunk. This penalty was generated from a gamma distribution (mean 23 min. ), which ensured that the transition seldom took less than 20 minutes, but delays of up to 35 minutes were probable, as the machine has to return to the same location to refit the head. These two penalties (productivity and interchanging) provided the only systematic deviation for DUAL from the productivity of the single-grip harvester. Two penalties were placed on the PROCESS capacity of the COMBI. Firstly, a penalty of 0.25 min.m-3 was incurred in compensating for possible reduced efficiency in handling and positioning the more cumbersome harvesting head, which is designed for both harvesting and loading. This has been referred to by some sources as a potential drawback ( cf. [11, 17] ), though none of the penalties on either machine were empirically quantified. Secondly, a productivity penalty was placed on the volume of timber processed directly onto the bunk, as this requires more handling than harvesting onto the forest floor. For the first thinning, this penalty was fixed at 15%, for the second thinning, 20% and for the third, 25% of TWIN harvesting time. Approximately 70% of the volume from the first thinning was processed directly onto the bunk, while for the second and third thinnings the figures decreased to 50% and 30% respectively, along with an increase in stem volume. The assumption here is that the bunk is fixed and not slewable in the in-feed direction. In the simulated thinnings, residual stand density is relatively high, and it was assumed that this would impede movement of the bunk. These two penalties were used as the only technical variables differentiating the felling-processing efficiency of the COMBI from that of the single-grip harvester. Table 3. The proportion of harvester MOVE time as given in a selection of time and productivity studies. Suadicani and Nordfjell  found that a high proportion of harvester MOVE time includes preparatory 'micro-positioning' of the machine, especially in early thinnings. Superimposing the systems in a work-procedural manner clearly illustrates that the work moment MOVE appears once each for the harvester and the forwarder in the TWIN system, twice for DUAL but only once for the COMBI. A problem encountered was how to apportion this saving to either the harvesting or forwarding element of the COMBI work-cycle. In forwarding, the MOVE component (Moving during Loading) almost exclusively refers to linear motion, which allows it to be modelled directly from technical parameters such as velocity and strip-road length. It was therefore evaluated that in-stand travelling with the COMBI was more precisely superimposed by the forwarder rather than the harvester, and the implied saving was accrued against the forwarder, as discussed under the next section. The forwarding working cycle is often divided into the sub-operations; Loading, Moving During Loading, Driving With Load, Unloading and Driving Empty  . In order to facilitate analysis at a sufficiently detailed yet comparative level, the forwarding function in the model was grouped into the following two elements; LOAD (Loading, Moving-During-Loading and Unloading) and DRIVE (Driving Loaded and Driving Empty). 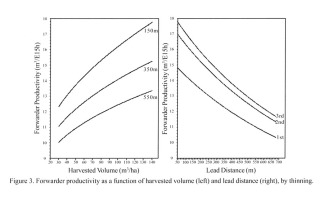 Productivity rates for loading, moving-during-loading and unloading, were based on productivity norms  for a thinning (after harvesting with a small single-grip harvester), valid for a range of 20 through 125m3/ha (Fig. 3). The productivity rates then arrived at were decomposed to the elements 'Loading', 'Moving-During-Loading' and 'Unloading' based on an assessment of the time studies given by  and  . 'Loading' was randomised around 60% (s.d. 5%) of the total LOAD time while 'Driving while Loading' and 'Unloading' times were apportioned with 50% of the remaining time each. Because the harvesting head on the COMBI machine makes for a more cumbersome grapple, the 'Loading' and 'Unloading' elements of LOAD are penalised against those of TWIN. This complied with the observations of  . The penalty placed on 'Loading' and 'Unloading' (approximately 80% of LOAD) for anticipated handling difficulties was generated from a triangular distribution with a mode, minimum, and maximum of 8%, 0% and 10% respectively. The COMBI has the ability to process logs directly onto the bunk to varying extents, depending on the working method, individual tree size, and the amount of handling space. Processing directly onto the bunk (so-called Integrated Off-Ground Handling) and saving on 'Moving-During-Loading' represent the most significant divergence from the productivity of the purpose built forwarder. In  it is shown that on a machine with a fixed bunk (non-slewing) this benefit comes at the expense of an increase in harvester PROCESS time of around 20%, which correlates to the 20% penalty imposed on the harvester in the previous section. The DRIVE component of the forwarding operation was simplified, and effectively only dependent on average extraction distance (lead distance). A mean (in-field) travelling velocity of 65 metres per minute (m/min) was used (both loaded and empty), and the load capacity of all three machines considered equal (13 m3). Time consumption for driving is also converted to E15 min/m3. Relocation refers to the movement of the machine from one working tract (object) to another and was calculated as the quotient of travel time and object volume (the product of stand size and yield per hectare) (min./m3). A uniform distribution was used in generating relocation distances and obtaining descriptive functions representative of the entire range (Table 2). Relocation time was determined from the distance generated (Fig. 4). Movement on road occurs at an average velocity of 15 km/hr (under own power) alternatively 60 km/hr (low-bed truck), and each move incurs a fixed time penalty of 30 minutes per machine. This 'set-up' time is incurred irrespective of relocation distance, and includes preparing to relocate as well as orientation on arrival in the new stand. Relocating outside of normal working hours does not affect G15 hrs. The rationale was that tasks that could have been completed before 10:00 would have been completed on the evening prior to the move (16:00-19:00 agreed overtime), and therefore only the time period 10:00 to 19:00 is of interest. This model provided a mean loss in utilisation due to relocation of 1.9 hrs. (s.d.1.2) per move, including 0.5 hrs. set-up. This loss arises mainly due to the fact that operations are discontinued for the day, following relocation by low-bed truck. Given the relocation distribution and probabilities in fig 4., the proportion of relocation under own power vs. by low-bed truck was 60:40. The productivity models were set up and run using the SAS® statistical package. This largely deterministic procedure was used to establish the relationships and sensitivities of the component variables, in keeping with the suggestions of  . The simulation was carried out at the stand level, where each iteration implied a new stand size and thinning number as well as a relocation and lead distance. 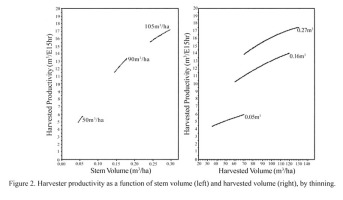 The thinning number in turn determined the silvicultural attributes of the stand, such as stem volume, initial stocking and thinning intensity (Table 1). Variation was induced using stochastic distributions for some of the attributes (Table 2). The ratio of first, second, and third thinnings was consistent, and each thinning included a large number of observations (> 20 000). The time-consumption for each system, the sum of the component machine times, was calculated simultaneously for each observation. Output data sets were analysed using the General Linear Models procedure of the SAS® statistical package where productivity models at the machine and system level were developed by, and across, thinnings. For clarity, each system will be subscripted H or F to denote whether the harvesting function or forwarding function of the system is being discussed (e.g. DUALH = DUAL Harvesting and DUALF = Dual Forwarding). The most significant determinants were used in deriving linear time-consumption functions by thinning and machine-system (Table 4). The mean relocation times per machine were 0.38, 0.23 and 0.19 min./m3 in the 1st, 2nd and 3rd thinnings respectively, as a result of increasing object volumes. There is a significant reduction in time consumption for harvesting between the first thinning and the second and third thinning, for all three systems (Fig. 6). TWINH and DUALH perform similarly across thinnings, though DUALH is slightly and consistently slower than TWINH. Time for interchanging the head amounts to around 23/objvol min./m3, the difference becoming less pronounced with increasing object volumes (0.085, 0.051 and 0.043 min./m3 for 1st, 2nd and 3rd thinnings respectively). 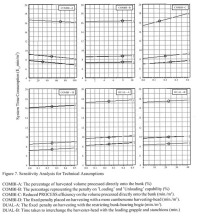 On average, COMBIH consumed 1.01, 0.51 and 0.42 min./m3 more than TWINH did in each thinning respectively, though the interaction with COMBIF makes it nonsensical to report each component separately (Table 4). Forwarding times were more consistent than harvesting time across all three thinnings (ranged between 4.1 and 4.8 min./m3) (Fig. 5). Mean harvesting volumes were 52.5, 89.7 and 105.3 m3/ha for each thinning respectively. Table 4. Parameter estimates for the system time-consumption models derived from the simulation output (net of relocation time). X1 = Harvest volume (m3/ha). X3 = Lead distance (m). X4 = Reciprocal of Object Volume (m-3). R2 > 0.95 for all functions. DUALF and TWINF converge with increasing object volume. The integrated off-ground handling capability strongly differentiates COMBIF from the others. This alone accounts for average reductions in COMBIF time-consumption of 1.24, 0.93 and 0.77 min./m3 by thinning, resulting from savings in loading-time. This advantage was slightly reduced by the penalty placed on the anticipated cumbersome loading grapple which resulted in increases in time-consumption of 0.10, 0.09 and 0.09 min./m3 for thinnings 1, 2 and 3 respectively. The saving on in-stand moving time equated to 0.72, 0.62 and 0.59 min./m in each thinning. These three effects fully explain the time-consumption differences between TWINF and COMBIF. The effect of relocation can be seen in the comparison of systems' time consumption and object volume (Fig. 6). Below a threshold of around 250 m3 both COMBI and DUAL are more competitive than TWIN. For DUAL, the saving in relocation time outweighs the burden of interchanging the heads more frequently. In DUAL-A the effect of altering the constant 0.25 min./m3 imposed because of the bunk-bearing bogie wheel-set inhibiting processing space is shown. DUAL-B shows the time taken to interchange the harvesting-head with the loading-grapple, and mounting or dismounting the stanchions on the bunk. This effect is virtually nullified by large object volumes. The time-consumption models arrived at in this study are based on empirical productivity norms for harvester and forwarder work-elements to which a number of technical and operational adjustments have been made. Sensitivity analyses were carried out on all assumptions, and systems' time consumption can be seen in Fig. 7, where the circles indicate the mean values used in the simulation. For COMBI, the heavier felling/processing/loading head was penalised to varying degrees. COMBI-A shows the effect a shift in the volume that is processed directly onto the bunk (%) would have on system time consumption. The associated benefit of reduced loading time with increasing 'integrated off-ground handling' is counteracted to some extent by increased processing times on this volume. COMBI-B shows the slight effect of penalising the 'Load' and 'Unload' functions of the machine by 8% of forwarder loading time, because of the heavier loading-grapple. COMBI-C shows the effect of the penalty imposed on the efficiency of processing directly onto the bunk, as this requires more complex handling. This penalty was incremented with tree size, based on the assumption that larger trees are more difficult to manoeuvre. The penalty is multiplied with the volume being processed directly, and is therefore most sensitive in the first thinning, where a higher proportion is processed in this way. COMBI-D shows the effect of the constant 0.25 min./m3 penalty placed on the harvesting head for reduced felling efficiency. An issue with multi-functional machines is that reliability is the product of reliability of the component parts  . It could be argued that integrated machines would have a lower technical availability than purpose-built machines. Using the time-consumption results from figure 5 together with technical availability levels of 81.8% and 86.4% for a harvester and forwarder respectively  , it can be shown that for COMBI, an availability of 80.2%, 77.5% and 77.8% in the 1st, 2nd and 3rd thinnings would be sufficient for the systems to break even. In a recent study  including 12 000 m3, three integrated machines (Pika 828) achieved availability levels of 79.1%, while a number of 7-11.5 ton harvesters showed levels around 84 %. Results from the simulation were compared with a number of published time studies on integrated machines (10,31,32,36). Mean stem-volumes ranged 0.09-0.16 m3 s.u.b. Corresponding values for the harvested volumes and lead distances were 37.5-79 m3/ha and 100-250 m. These parameters were put into the functions for 2nd thinnings (DUALTOT and COMBITOT) in Table 4. Where necessary, G0-time was converted to G15- time using a factor 0.835  . Our results were 14-27% lower than  , 3-32% lower than  and 17-36% lower than  . They were however much closer to the findings of  , where they varied from 11% lower to 8% higher than those. Terrain conditions were probably the single most significant factor in this deviation. Difficult terrain would increase the forwarding component of total time consump tion disproportionately and affect especially COMBI negatively. Energy consumption is of economic and ecological importance. A reduction in fuel consumption reduces emissions to the same extent  . There is a good correlation between fuel consumption and time consumption to different work elements, which means that the amount of fuel consumed per productive machine hour (PMH) is relatively constant  . Assuming the machines in this study have the same rate of consumption per PMH, COMBI will consume 5-10% less fuel than TWIN on stands of 5 ha (cf. Fig. 5). On smaller stands (2 ha.) the corresponding values will be 9-13% less for COMBI and 1-2% less for DUAL (cf. Fig. 6). Reduced relocation times are a primary advantage of the integrated machine systems. This makes them suitable in forest operations involving lower object-volumes (light or early thinnings), or more frequent and longer relocations. The relocation model presented in Fig.4 requires further elaboration. The half-hour set-up penalty could be too high where stands are strongly clustered and where thinning prescriptions are very similar. The effect of reduced work-place time resulting from relocation needs to be internalised in the model. The frequency and cost of utilising a low-bed truck to relocate the machines should be retained in the simulation and used to further differentiate the system costs. To evaluate the extent of relocation time to work-place time, empirical data on the size and mutual distances between stands is required. This is not necessarily related to forest density. For example, in the boreal forests in Finland, Asikainen  uses average relocation distances of 30 km alternatively 50 km. The study has largely been concerned with time-consumption. Differences in machine-costs could change the suitability rankings. A break-even analysis was carried out to allow for comparisons to be made across international economies. The hourly operating cost of a single-grip harvester (including all cost-components) is set at index 100 (HARV100) and the cost of a purpose built forwarder at index 75 (FORW75). 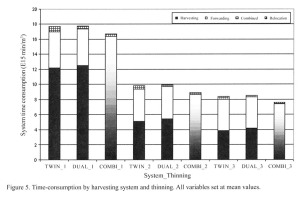 Figure 8 shows what the maximum hourly machine cost (as a percentage of HARV100) can be for the system to operate at economic equity with TWIN. The y-axes show the cost of using DUAL / COMBI relative to that of using TWIN (unit currency/m3). At 100% (where the system costs break-even), the x-axes give the maximum hourly charge permitted on DUAL / COMBI as a percentage of the Harv100. For thinning 1, one could at most pay 94.5% of Harv100 to break even. In the case of thinnings 2 and 3, this figure falls to around 90% and 88% respectively. For COMBI, there is a percentage increase from 101% to around 104%, as COMBI outperforms TWIN in all thinnings. In this study, we have attempted to simulate contemporary harvester / forwarder systems in various operating environments, then adjust some technical parameters to emulate two integrated machine concepts. The analyses identified a number of points both favourable and disadvantageous to the absolute superiority of any of the systems. However, in Scandinavia at least, the sustained research & development effort focused on integrated machines by all major manufacturers through recent years is evidence of a collective recognition of the potential these machines may hold for future mechanised CTL operations. Aedo-Ortiz, D., E.D. Olsen and L.D. Kellogg 1997. 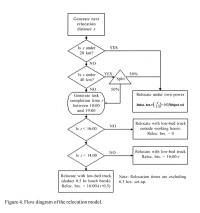 Simulating a Harvester-Forwarder Softwood Thinning: A Software Evaluation. For. Prod. J. 47(5): 36-41. Andersson, J. 2002. Drivarens prestation i slutavverkning _ en jämförelse av tre avverkningsmetoder [Harwarder productivity in final felling _ a comparison of three harvesting methods]. The Swedish University of Agricultural Sciences, Umeå. Student Reports in Forest Technology no. 56. 24 pp. Anon. 1984. Gallringsmallar- Södra Sverige [Thinning prescriptions, Southern Sweden] The National Board of Forestry, Sweden. 35 pp. Anon. 1997. Underlag för prestationsprognos: Engreppssködare, gallring [Basis for calculation of productivity norms: Single-grip Harvester in thinnings]. MoDo Skog AB, Sweden. Internal company guidelines. 1 p.
 Asikainen, A. 1995. Discrete-Event Simulation of Mechanized Wood-Harvesting Systems. D.Sc. Thesis. University of Joensuu, Finland. ISBN: 951-708-357-2, 80 pp. Asikainen, A. 1998. Chipping Terminal Logistics. Scand. J. For. Res. 13(3): 386-391. Athanassiadis, D. 2000. Ressource Consumption and Emissions Induced by Logging Machinery in a Life Cycle Perspective. Doctoral thesis, Swedish University of Agricultural Sciences. ISBN 91-576-5877-3. 75 pp. Berg, S. 1991. Terrain Classification System for forestry work. Forestry Research Institute of Sweden, Uppsala, Sweden. ISBN 91-7614-078-4. 29 pp. Bergkvist, I., U. Hallonborg and B. Nordén 2002. Valmet 801 Combi i gallring med fast lastutrytme för standardlängder. [Valmet 801 Combi in thinnings with a rigid load bunk for standardised log lengths]. SkogForsk Work Report no. 518. 15 pp. Björheden, R. and B. Dahlin, B. 1999. The Complete Logging Machine _ the Feasibility of the Harvester-Forwarder in Swedish Forestry. In: Kellogg, L. [Ed.] Proceedings of the IUFRO 3.10 Conference on 'Timber Harvesting and Transport Technologies for Forestry in the New Millenium', South Africa. Bredberg, C-J. Personal communication. The forest operational section of Holmen Skog AB Forest Company, Örnsköldsvik, Sweden. Eliason, L., J. Bengtsson., J. Cedergren., and H. Lageson. 1999. Comparison of Single-Grip Harvester Productivity in Clear- and Shelterwood Cutting. Int. J. For. Eng. 10(1): 43-48. Gellerstedt, S., and Dahlin, B. 1999. Cut-To-Length: The Next Decade. Int. J. For. Eng. 10(2):17-25. Glöde, D. 1999. Single- and Double-Grip Harvesters _ Productive Measurements in Final Cutting of Shelterwood. Int. J. For. Eng. 10(2): 63-74. Gullberg, T. 1997. A Deductive Time Consumption Model for Loading Shortwood. Int. J. For. Eng. 8(1): 35-44. Hallonborg, U. 1998. Drivare _ En analys av maskiner för avverkning och transport. [Loggers _ An analysis of machines for harvesting and transport]. SkogForsk Work Report no. 392, 26 pp. Hallonborg, U., S. Bucht and S. Olaison. 1999. A new approach to thinning: Integrated off-ground handling reduces damage and increases productivity. Resultat _ Skogforsk Research Report No. 23, 4 pp. Hillier, F. and G. Lieberman . 2001. Introduction to Operations Research. McGraw-Hill. New York. ISBN: 0-07-232169-5. 1199 pp. Hånell, B., T. Nordfjell and L. Eliassion, L. 2000. Productivity and costs in shelterwood harvesting. Scand. J. For. Res. 15:561-569. Kellogg, L. D. and P. Bettinger. 1994. Thinning Productivity and Cost for a Mechanized Cut-to-Length System in the Northwest Pacific Coast Region of the USA. Int. J. For. Eng. 5(2): 43-54. Kuitto, P-J., S. Keskinen, J. Lindroos, T. Oijala, J. Rajamäki, T. Räsinen and J. Terävä. 1994. Mechanized cutting and forest haulage. Mätsäteho Tiedotus, Report 410, Helsinki, Finland ISBN 951-673-139-2. 38 pp. Lageson, H. 1997. Effects of Thinning Type on the Harvester Productivity and on the Residual Stand. Int. J. For. Eng. 8(2): 7-14. McNeel, J.F. and Rutherford, D.1994 Modelling Harvester-Forwarder System Performance in a Selection Harvest. Int. J. For. Eng. 6(1): 7-14. Mellgren, P-G. 1989. More Reliable Multi-Function Wood-Harvesting Machines in the Future? Int. J. For. Eng. 1(1): 10-14. Nordfjell, T. Athanassiadis, D., and Talbot, B. 2002. Fuel Consumption in Forwarders. Int. J. For. Eng. 14(2). In press. Oinas, S. and L. Sikanen. 2000. Discrete event simulation model for purchasing of marked stands, timber harvesting and transportation. Forestry 73(3): 283-301. Sirén, M. and H. Aaltio. 2003. 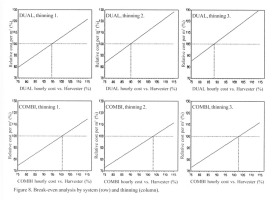 Productivity and Costs of Thinning Harvesters and Harvester Forwarders. Int. J. For. Eng. 14(1): 39-48. Suadicani, K. and D. Fjeld. 2001. Single-tree and Group Selection in Montane Norway Spruce Stands: Factors Influencing Operational Efficiency. Scand. J. For.Res.16:79-87. Suadicani, K. and T. Nordfjell. 2002. Operational Aspects of row and selective thinning in the establishing of a shelterwood in a 50 year old Norway spruce stand. Int. J. For. Eng. 14(1): 29-37. Tufts, R.A. and R. Brinker. 1993. Productivity of a Scandinavian cut-to-length system while second thinning pine plantations. Forest Prod. J. 43 (11/12):24-32. Wester, F. 2001. Kostnad och prestation för en ny typ av drivare. [Productivity in thinning and final felling for a new type of combined harvester-forwarder.] The Swedish University of Agricultural Sciences, Umeå. Students Reports in Forest Technology no.47. 29 pp.